Pantone has announced it's first character based, branded Pantone colour, Pantone Minion Yellow, which is inspired by the Minions characters from the popular Despicable Me film franchise. Pantone say that Minion Yellow is an "illuminating, energetic, friendly and fun-loving yellow shade that immediately calls out to you". Whilst Leatrice Eiseman, Pantone's Executive Director said of the new colour "this is the colour of hope, joy and optimism". The new colour is the result of a partnership of the Pantone Colour Institute and musician Pharrell Williams, who helped create the music for the Despicable Me franchise. 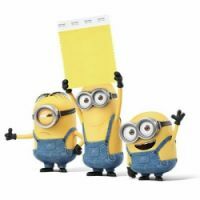 Pantone also worked closely with the Illumination Entertainment animation team to identify a colour that was "the most pure representation of the Minions iconic yellow". Pantone Minion Yellow will be added to the Pantone Fashion, Home + Interiors colour palette in the next Pantone colour addition update.